This Gaming Mouse Has a Fan. A Spinning Fan. Really. Taiwanese peripheral maker Thermaltake created this: a gaming mouse with a fan that, and I quote, "blows away your gaming tension and sweat." Better than just saying "it blows". 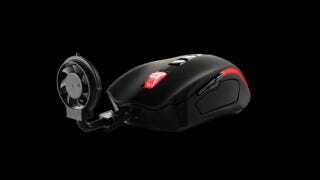 Thermaltake's Element Gaming Mouse Cyclone Edition's cooling fan is detachable, because, c'mon. The Cyclone Edition is the world's first pro-gaming mouse with a fan—and probably the last.